The event was attended by approximately 200 guests including our local Mayor Cindrich, congressman Peter Harckhan, several staff members & clients of North East Westchester Special Recreation, many Mount Kisco Rotarians, local residents and many others. 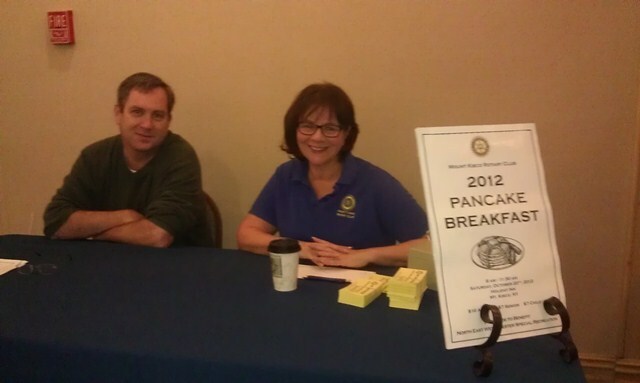 Mount Kisco Rotarian Linda Carrington welcomed our guests with help from Whitney Singleton and Harry Reynolds. The Mount Kisco Rotarians served many different breakfast items including scrambled eggs, bacon, sausage, waffles, pancakes, and coffee to the attendees. The proceeds raised will benefit the North East Special Recreation. One of their missions is "To be a community based, therapeutic recreation program coordinated among the various recreation departments." The Rotary motto is service above self, and today the Mount Kisco Rotarians performed their service at the breakfast to assist to raise money towards this worthy cause.